Please email Reginal Allyn at learning@srt.com.sg or call 6221 5585 for more information. Stage Camp by SRT continues this June with adventures into the wonderful world of Roald Dahl. 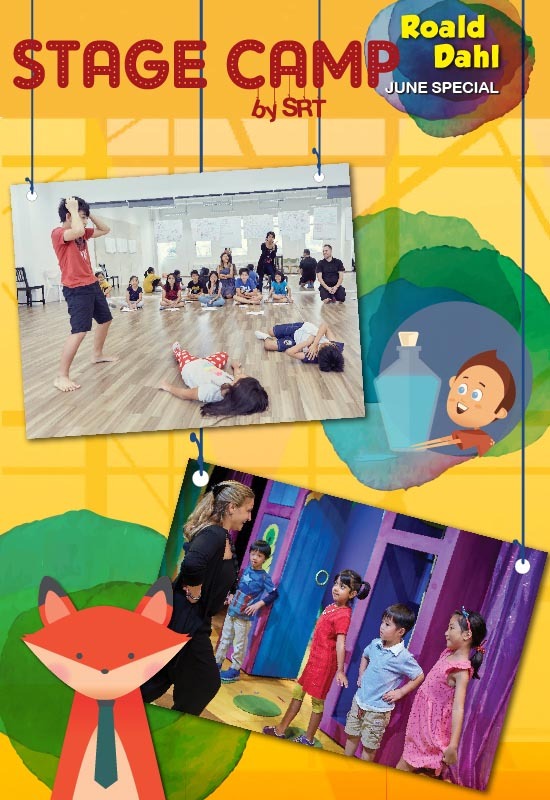 Let PLAY Stage take your child on a fun adventure with Fantastic Mr. Fox! • Bring their stories to life, through the magic of theatre. Don't miss this exciting week of drama, music and movement which culminates in a presentation at the end of the week for friends and family. Working with an experienced theatre practitioner, THEATRE Stage allows participants a chance to explore the world of George's Marvelous Medicine. This fun and interactive workshop focuses on the art of Storytelling and its techniques. This programme is perfect for children who have experienced theatre or are taking their first steps into drama. • Improve their communication skills. Come join us for a week of fun which culminates in a devised presentation at the end of the week for friends and family. Working with an experienced theatre practitioner, ACTING Stage focuses on learning and developing performance skills for the stage. Using the story of The Twits as a springboard for ideas, the participants will look at fun and wacky ways in which you can tell stories of your own and how you can go about turning them into pieces of theatre. It is perfect for young people with an interest in stories, writing, performing and theatre.